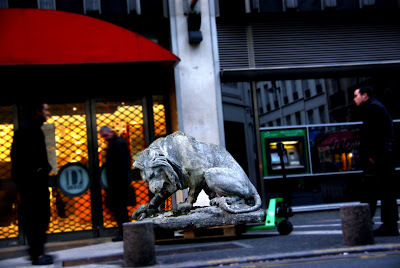 ParisDailyPhoto: Can you park you lion please?! As you may remember I live near Drouot, the main Paris auction house. The nice thing about living there is that sometimes, in the morning, you come across weird scenes like this; a lion sculpture being delivered to the house, probably to be sold in the coming days. Passers by were really intrigued and so were the delivery guys when they saw me take my camera and shoot! A fierce looking lion! Such a change from the usual placid looking lion statues I see. When enlarged this photo is even better! Is he snarling at an equally gaping fish? Or is he scratching at a clump in the kitty litter? I'm intrigued very greatly by sculpture pieces and the amazing artists who sculpt them!! and all of art for that matter. I've loved it since I was 5! When I was in Paris,I could have lived inside the Musee du Louvre.It was a complete magical place.I was mesmerized by all of the great artists of the past+present. The redness of the canopy seems rich next to the '' grayness '' of the rest of the photo. Is their going to be a lion on top of it? I had such a wonderful time in your beautiful city this weekend...sadly it was for a few days only but I love Paris and would go back again and again. This was my fifth time there and I love it more and more each time. That thing must weigh a ton! Whoever gets it won't be able to haul that thing with their SMART car. It is large, and I'll bet HEAVY! but it is a visually interesting picture, Eric. Thank you! You have quite a skill for being in the right place at the right time! At first I thought it was part of a bigger sculpture of one of Paris monuments, or part of a famous bulding and that it was going somewhere to be repaired. What I really think it's odd is the fact that this sculpture isn't in a box or something like that to protect it. It is out there in the wild, I mean in the streets, as if someone who just went out to walk his dog, I mean, his lion. Ah, that lion sculpture would look good on my porch... ;-) But I think I'd need at least two so that they could keep each other company. lol What a fun neighborhood you reside in! SUZY and LYNN, come out come out! I want to see your twin pix again!!! They're so fun, I love the way you manage to take the exact same picture. "Where is Androcles when I need him??" Oooh, Chessa got to go to Paris for the weekend. Wow! I'd love it, but then again I don't think I could stand it. It's hard to leave Paris even after a long stay. In gazing at this photo I'm wondering where this statue came from. It seems to belong somewhere, perhaps in a stately home or a grand garden. This poor lion is out of his element. I wonder who lost him and why. Now that's somthing you don't see every day! I did a painting once of two lions at the San Francisco zoo. However, they did not look as lively as this one. It was during the day and they sleep during the day being nocturnal. I'm reading Hugo's "Notre Dame de Paris" and he mentions lions many times. For instance, "The said dolphin, then, was handsome, was young, was brave; above all (splendid origin of all the royal virtues) he was the son of the Lion of France." And, "...the inevitable arrival of the people who would, as always, take the lion's share. ... as in the Hall of Chimneys of the Palais de Justice in Paris." 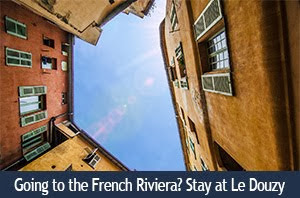 And, ...From the Notre-Dame tower, the Hotel de Saint-Pol, though almost hidden by the.... The mansion for the lions, with its low pointed arches supported by short...." "...the lion house, with low Gothic arches on short Saxon pillars, its iron portcullises, and continual roaring; cutting across the whole the scaly spire of...."
There is way more! Anyway, you get the picture. The moment I saw the pic, I thought "where is this monument?" So how's the weather in Paris -- the people look cold in your photo. I was in the office (Silicon Valley) at my desk today, and looked out the window like I always do, and I saw it snowing on the mountain tops. The tops of the mountains being white blending in with the white snow falling and the white sky made it look like there was no line between mountain and sky. It was heavenly. Made my day. We are having a cold winter in the Bay Area this year -- early snow! In the news this morning they said there was 3 feet of snow in the last 24 hours at Kirkwood. Get out your snow boards! Like the lion but you know what? I think I love the dynamics of life and Paris going on around it even more! Well on the portal I thought it was a Shar-Pei. I didn't have my glasses on ok?? Eric, I swear I say it every day...only in Paris could you wake up , go out and find a gigantus lion statue sitting on the sidewalk. The only thing i have ever found on my street in the morning is a squirrel or two. I wanted very much to visit Druot when I was in Paris, but didn't have the time. I don't know if you've ever posted photos of it inside (are you allowed to photo in there?) but I'd love to see your take on it, Eric. I'm a cat person so I'd probably bid on that one! Nice shot, Eric. That is what I call a cat lover! Next thing you will tell us you are adopting a lion cub lol! GF Cali!! Keep going... still a few days left! I would so love to have that Lion out in the middle of my farmyard !!! from cali -- way to go, GF! Eric -- love the touches of red, green, and gold in this otherwise gray and black image. Would love to know who purchases this kitty—and where they put him. Years ago, I had a wealthy boss who had huge lions like this at the end of his driveway. One was stolen and he was certain the thief was one of the staff! The nerve of him. Now that I think of it, maybe this is his stolen lion! HAHAHA Drummond - that's too funny. Lois Simon is not kidding - we have snow! Or at least we can see snow on the mountains in the distance. It's brrrrrr brrrrrr cold here in the Bay Area. We pay a lot of money at live here - - - so if the weather is going to be like everywhere else, I want my money back! Eric what a great item for the sale! Wow. I am working at the auction house tomorrow - I take phone bids, like Guille does. We don't have a lion like this! There are some animals - some very old teddy bears! I would love to go to this auction house. This lion must have had people staring for ages. Monica here I am! Sweet of you to say. YOU are looking FAB though. My goodness how glam you are and I adore those earrings! Wow. What a beautiful young woman you are. 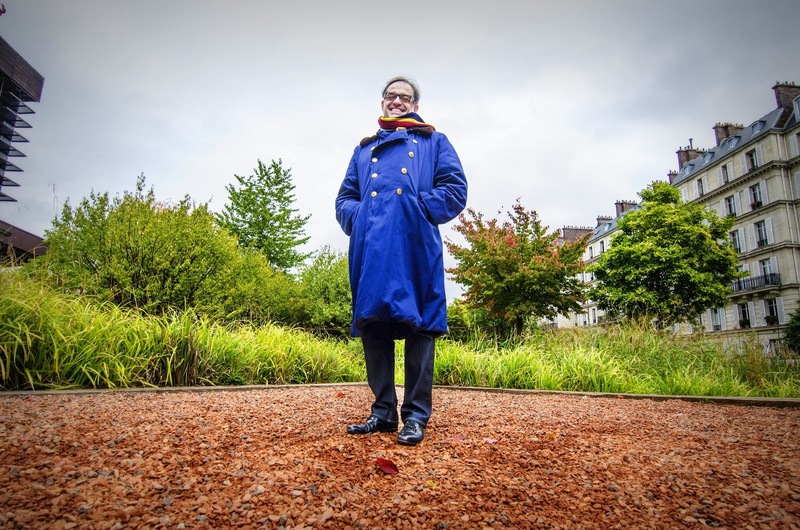 Drummond - LOL - You reminded me of something from a couple years ago - I once had a long, detailed conversation with a friend as we sat on a crowded tour bus filled with adults and children. I was telling her I'd been practicing shooting children and that some of my friends who had children had volunteered to let me shoot their kids because I needed practice shooting kids. As I told her what a really great time I'd been having my eye caught the absolutely horror struck faces of some 7 or 8 year old girls a couple seats away......They clearly didn't know I was talking about my camera!!!! Oh no... Eric is late! I hope he is not at work still! This lion is about to get a ticket: he's been here for almost 24 hrs. You know, he says he's working a lot, but I think he just has a packed dating schedule. Don't kid yourself USe: a packed dating schedule is work! "Don't kid yourself USe: a packed dating schedule is work!" Eric: come out, come out wherever you are!!!! Lynn I'm blushing now! Thanks for your sweet words. Right back at you!! !